Click here to save up to 55% on the Bushnell 1-4×24 in 2017! Master any tactical scenario with one of the best riflescopes in the market today – the Bushnell AR Optics FFP Illuminated BTR-1 BDC Reticle AR223 Riflescope. Made with the finest weapon materials and advanced combat rifle technology, this model is a must-have for any serious hunting enthusiast. Learn all its advantages and disadvantages below for you to see whether it’s a good fit for your current weapons arsenal. Anyone who likes to challenge himself in difficult target shooting practices and hunting missions knows the difference between rifling with a scope and without one. If you are aiming to hone your skills to be a top gunman, you need to master all practical rifle handling techniques. You also have to gain enough experience to immediately determine which technique is suited for a specific terrain and environment. To match expert skills is an expert rifle and the Bushnell AR Optics FFP BDC Reticle AR223 Riflescope can make any rifle a suitable fit. After reading our Bushnell 1-4×24 review you will know for sure if it is the right rifle scope for you. Throw Down PCL – he scope has its own exclusive power change lever to make quick power change. This is very suitable for fast-paced shooting games. For real-life combat, a few seconds can make a difference between life or death situations so a weapon that can function faster will give you higher chances of survival. Highly Durable Make – the entire enclosure protecting the delicate parts inside is made of high quality and resistant aluminum alloy. The model is also anodize-finished with strict sealing. Makes a good choice for rough combat and long term use without means of proper maintenance. Nitrogen-filled Body – to prevent any fog formation on the lens or leakages that might affect its optical performance, it has been infused with Nitrogen to keep it dry. The exterior is scratch proof and all parts inside are rust proof. Advanced Engineering Optics – the Bushnell AR FFP Illuminated riflescope has an illuminated first focal reticle for enhanced aiming accuracy. The lighting set-up is compatible for all eye types and prevents heavy strain during prolonged use. The technology behind the lenses and reticle are good for targets up to 600 yards away. Moreover, it has adjustable 0.1 MIL click target turrets that don’t lock for fast precision adjustments. Multi-coated Optics – see your targets in clear view even with the brightness in the background changing. The different levels of coats on the lenses allow a lot of light to pass through the scope and into the eyepiece. Hard cover missions and stealth mode operations are best conducted with scopes of similar ability. Sophisticated Design – its elegant lines and curves added with the matte black finish makes the Bushnell AR Optics FFP Illuminated BTR-1 BDC Reticle an aesthetically good match to even the most expensive rifles in the market. 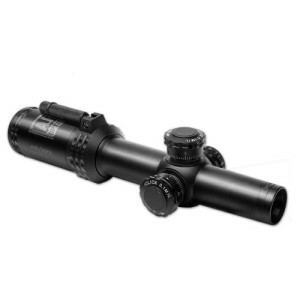 It can be considered a top notch scope at first glance due to its streamlined form. 93mm Eye Relief – keep up with long hours of tracking and tailing without damaging your eyes with its eye relief feature. Like most advanced scopes with high magnification and wider covered ranges, the eyes need to be dilated to an extent to obtain a full view of the target. Average scopes would have the eye very close to the lens, adding much strain to the eyesight. An eye relief of about 3.6 inches would give just the right amount of leeway for convenient target aiming. The reticle is shaped like a horseshoe so that when you change to red dot or 1x magnification, the reticle doesn’t obstruct the view. Lasts for a long time due to durable materials and comprehensive proofing features. Suitable for hunting or 3gun compilation. User-friendly and very easy to learn and handle. Doesn’t require a lot of maintenance or specific storage requirements since it is resistant from dust, shock and scratches. You can still aim at targets even if the red dot fails since the horseshoe reticle is present. You just have to secure a bright area since there would be no illumination. Clear optics suited for most eye conditions. Can also be used by people who had previous eye surgeries without causing any damage. 1x magnification allows the use of the red dot for close range targets. Fast power transmission due to the power lever. First focal plane reticle allows constant BDC values regardless of the power setting. Slightly heavier compared to scopes with similar abilities brought by the massive ocular bell. Turret resets require loosening 3 Allen screws each and every time so it is a chore compared to a spring-loaded turret set-up. Turrets are also fundamentally larger than standard dimensions. The lifetime warranty offered by Bushnell does not cover the electronics so you’ll have to pay for internal damages. Although, this is highly unlikely since the case is shock proof. Turrets can’t be locked so there’s a danger you might hit it when you make adjustments on the magnification. However, this can be avoided once you get used to its presence. Following the standard guidelines for scope design, this Bushnell riflescope model is added with optimized features in order to properly support 5.56 rounds. It is reported to work well on a Colt M4 Carbine 22 or a 22AR. A Sig M400 also holds up well with this model. You might need different sizes of scope rings for different rifles since the necessary clearance to avoid contact between the cap and receiver or scope base greatly vary.It requires a 30mm ring, so you can find options from various manufacturers. For a little over $200, this model is very affordable if you take into consideration all of its features. It is rare to find in local weapon shops, so it would be best to get it online. If you are looking for a way to improve your skill and aiming accuracy, a clear optic model such as the Bushnell AR Optics FFP Illuminated BTR-1 BDC Reticle AR223 Riflescope can.